Moto 360 comes in a circular housing and reminiscent of classic watches, while LG G Watch, in a cubic as with most. Both should arrive in the next few months. 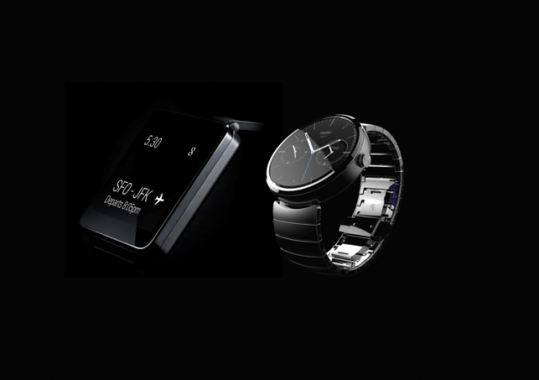 Motorola has released the first photos of their new smartwatch Moto 360. This device, which uses the platform, Android Wear, differs from previous smart watches at a much more elegant circular design reminiscent of classic analog watches. Moto 360 responds to voice, so users can easily query to find out everything that interests them. Global sales start in the summer, and will firstly be available in the U.S..
LG yesterday reported that they will present their first watch with Android, LG G Watch, in the second quarter. This is the fourth device that LG and Google are working together. The watch will be compatible with a range of Android devices and will display relevant information to users when they need it or when they says ‘Okay, Google’. The famous watchmaker Fossil has also announced that it was working with Google on the Android device.